Phil called radio 5 live today because Adrian Chiles was discussing mental health on his show. Phil’s daughter Kirsty made a recording of Phil’s contribution to the show. Shona Robison MSP said the health board must do more in the wake of criticism of its treatment of mental health patients. Concerns were expressed by members of the public at a meeting about the proposed centralisation of inpatient mental health services to Dundee’s Carseview Centre, removing facilities from centres near Brechin and in Perth. Meanwhile, a fatal accident inquiry will resume in December into the death of Charleston man Dale Thomson, who took his own life just days after discharging himself from the facility, and whose family believes he wasn’t given the right treatment. Several other families have also come forward in recent months to criticise the support given to relatives with mental health conditions. Ms Robison said she had been told “very clearly” by NHS Tayside that the Carseview unit would be able to meet demand should services be relocated as staff would not be spread “too thinly”. She told the Tele: “I am told very clearly by NHS Tayside that the capacity will be there because they will be able to use the skills of all of the staff to support those who have acute mental health facilty requirements. Ms Robison added that while efforts were continuing to support people in settings outside of hospital, the board had to ensure inpatient services were up to scratch. “It’s a very small number of patients who will ever require inpatient mental health facilities,” she said. “But when they do, it’s really important that the quality of those services and the staffing of them is as good as it possibly can be, because they are acutely ill at that point and need all the expertise and support around them. 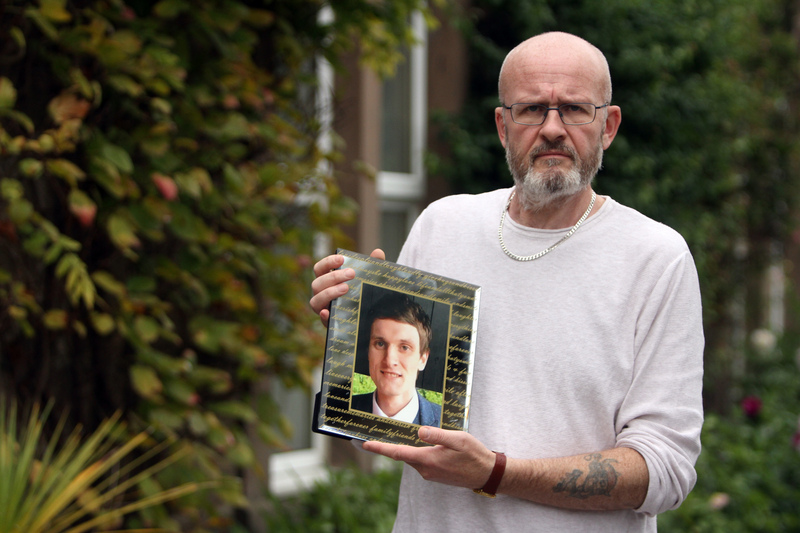 A Dundee pensioner fears he will die before he knows why his son took his own life. David Ramsay was found dead at the city’s Templeton Woods on October 9 last year. Before he died, the 50-year-old had been in the throes of a mental break down which led to psychosis. David’s GP then contacted NHS Tayside’s Carseview Centre by emergency referral with a view to him being seen by mental health staff. But David’s dad, David Ramsay Sr, claims the medics decided against admitting his son — and his body was discovered four days later. A year on, speaking publicly for the first time since his son’s death, Mr Ramsay said he was “in limbo” over the circumstances. He also believes his son might still be alive if he had been admitted to one of the wards at Carseview. The 79-year-old, of St Mary’s, says that NHS Tayside officials have refused to include him in discussions about David’s death due to him not being listed as his son’s next of kin — despite claiming his son’s family are happy for him to be involved. Mr Ramsay says he fears he’ll go to the grave without getting answers over what happened to his son and why he wasn’t given the treatment he felt he needed. He said: “All I want to know is what happened — but they told me because I wasn’t listed as his next of kin I wasn’t entitled to any information. In the aftermath of David’s death, the family met NHS Tayside chiefs and a local adverse event review took place. Mr Ramsay, who is now being represented by solicitor Danny Devine, of Myles Muir and Laverty, said he was kept in the dark about its progress and findings — and is now pushing for a fatal accident inquiry to be held. Mr Devine told the Tele: “I contacted NHS Tayside as I believed my client should be involved in the process surrounding the death of his son. I did not agree with the response from the health board. An NHS Tayside spokeswoman said it would be inappropriate to comment. A leading clinical psychologist has admitted “systems failings” in Dundee’s Carseview Centre could have led to the death of a city man. Linda Graham, who is deputy head of psychological services for NHS Tayside, was giving evidence at a fatal accident inquiry into the death of Dale Thomson. Dale, 28, of Charleston, was admitted to Carseview mental health centre on January 8 2015 but discharged himself two days later. He was re-admitted on January 22 and, after an appointment at Carseview the following day, was again allowed to leave. Dale was found dead by his mum Mandy McLaren, 49, and his twin brother Billy at home on January 2, having hanged himself. Ms Graham was co-chairwoman of a significant clinical event analysis (SKEA) report into Dale’s death. Among the findings of the report was that during Dale’s stay in Carseview between January 8 and 10 he was not seen by a consultant psychiatrist, and the consultant on call was not made aware that he had been admitted to the hospital. The report told how “it was assumed that the ward junior doctors would communicate this to the consultant grade. This did not happen with Mr Thomson and although the supervising consultant visited the ward to review another patient in similar circumstances, Mr Thomson was ‘missed’ on this ward round”. Ms Graham told the inquiry that it was likely a compulsory detainment under the Mental Health Act may have been sought by a consultant, instead of Dale being allowed to discharge himself on January 10. The court also heard from Dr Allan Scott, a consultant psychiatrist who had been asked by the Crown to produce two independent reports detailing his findings into the dad-of-one’s death. He was of the opinion that Dale should have been seen by a consultant within 24 hours of admission, based on guidance from the Royal College of Psychologists. Dr Stuart Doig, NHS Tayside’s clinical director for mental health, told the court it was his understanding that about half the health boards in Scotland use the “24 hour rule” as standard practice. He said a lack of resources, along with some boards having multiple hospitals, meant it wasn’t practical for it to be adopted by every board. He said NHS Tayside used a system of “safety huddles” for patients admitted at weekends — daily telephone conferences where medical staff discuss new inpatients with the on-call senior consultant. This system was incorporated after Dale’s death, he added. The inquiry was adjourned until December. Phil fears local mental health services will be unable to cope. The father of a Dundee man who took his own life fears local mental health services will “implode” if plans to close NHS Tayside’s Mulberry Unit go ahead. Lee Welsh, 27, died in August after suffering from mental health issues. Now his father, who is pursuing a complaint against the medical practice where the 27-year-old was a patient, has had first-hand experience of the system and says he is worried about the strain on services in Dundee if the move goes ahead. Phil Welsh began to suffer severe anxiety and symptoms of agoraphobia following Lee’s death and was treated at Dundee’s Carseview Centre. He says the treatment he received was “brilliant” but he fears the touted closure of the Mulberry Unit at Stracathro Hospital, near Montrose and the transfer of services to Carseview will heap too much pressure on staff. NHS Tayside’s three-month public consultation on mental health and learning disability services ended last week. Last night health bosses insisted they would take all responses on board when weighing up a final decision – and stressed that the aim was to create centres of excellence for patient care. The preferred option on the table is to close the Mulberry Unit and transfer services and staff to Carseview. However Mr Welsh said he had grave concerns about the proposal. “I can only see the entire situation imploding,” he said. “It looks like centralisation is the way they want to go. I still think there should be something else there, like the Edinburgh Crisis Centre, somewhere for people to go and have a chat with someone. Mr Welsh said forcing patients who are already under great strain to travel from Perthshire and Angus to Dundee for treatment could be disastrous. He added: “I hit the wall about six weeks after Lee’s death. I’ve never experienced anything like it in my life, it was awful. Chief officer for Perth and Kinross Health and Social Care Partnership Robert Packham said: “Should the preferred option for mental health and learning disability services in Tayside be approved, it would allow us to make better use of our nursing and medical staff enabling us to continue to deliver high quality, sustainable patient care. “Locating all General Adult Psychiatry (GAP) acute admissions at Carseview and specialist services and Learning Disabilities at Murray Royal will allow us to create centres of excellence through shared learning/experiences and remove unnecessary variation across localities. “The preferred option would mean that GAP acute admission beds in Mulberry Ward at the Susan Carnegie Centre and Moredun Ward in Murray Royal Hospital would relocate to Carseview Centre. “It is important to note that if the preferred option is approved, the staff from the Mulberry Ward and the Moredun Ward would move with their patients to ensure continuity of clinical care. The nursing teams would also benefit from additional staffing resources. “People across Angus, Dundee, and Perth and Kinross have shared valuable feedback during the three-month consultation on proposals for Mental Health and Learning Disability Services in Tayside.